Team Polaris' Lhakpa Tsering, who won the Raid de Himalaya in 2015, had a stroke of bad luck right at the start of the 2018 edition of the Raid. Lhakpa ended up retiring on the first day of the rally, due to an electrical failure on the RZR 1000 Turbo Dynamix that he was piloting. Unfortunately for him, this happened on the first stage in the Kargil sector, putting an end to his outing at the event. The first stage of the Raid led competitors from Kargil to Sankoo, Umba La (at an elevation of 4496m), then to Drass. 200 competitors in total are competing in the Raid this year, with a total of 75 teams in the Raid Xtreme category that in turn comprises of Xtreme 4X4, Xtreme Moto and Xtreme Alpine. Another casualty on the first day of the Raid was the Sri Lankan team of Sarfraz Junaid and Akhry Ameer, who were driving a Nissan pick-up truck that was shipped all the way from Colombo. 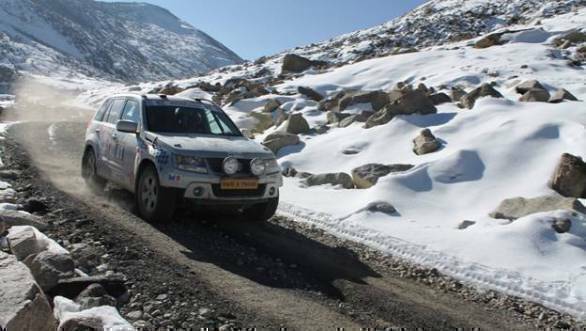 "The Sri Lankan pair probably didn't realise how tough the Raid is," said Vijay Parmar of Himalayan Motorsport. In the Xtreme Moto category, R Nataraj of Team TVS is led the timing sheets, while Vishwas was in second spot. Jatinder Jain from Nagpur, riding a KTM 450, ended the day third. It is his first attempt at the Raid de Himalaya. Syed Asif Ali dominated the Alpine category of the Raid Xtreme class, astride a TVS N-Torq. Ashok Munne of Nagpur, and Vinod Rawat of Mumbai, the two motorcyclists who are amputees, finished the first day of the Raid successfully.